Oftentimes people say the scripture of Christianity cannot coexist with scientific theory. 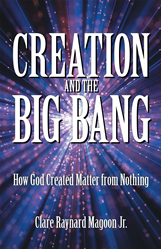 Author Clare Raynard Magoon, Jr. debunks that notion by releasing his new book, “Creation and the Big Bang: How God Created Matter from Nothing,” a perfect blend of a scientific take on the Big Bang theory and a creationist point of view. In the book, Magoon demonstrates through his research and through Scripture (especially Genesis 1:1) that God himself created the heavens and the earth and that this falls perfectly in line with the Big Bang theory and is the only explanation for how we got the universe from nothing. “Creation and the Big Bang” also looks at new scientific discoveries and studies of the founding scientists who studied our origins, clearly demonstrating how the science giants (Bacon, Newton, Planck, Einstein etc) were all believers and sought after a creator behind the mystery of the cosmos. Readers will be very intrigued in the central messaging to find out how Magoon synthesizes the widely believed Big Bang theory along with the scripture that proves God created the world. By Clare Raynard Magoon, Jr.
Clare Raynard Magoon Jr. was born in Rockford and raised in Cedar Springs, Michigan. After attending the Moody Bible Institute for one semester, he joined the US Army, making it his career. Magoon was on active duty as a soldier for six years and then served as a civilian, working as an engineer and executive for an additional twenty-nine years. Traveling the world, he was able to observe a variety of cultures and religious practices throughout Europe, Asia, and North Africa, and Creation and the Big Bang draws on these experiences. To learn more, please visit https://www.claremagoon.com.